By the time David Garrick staged his Shakespeare Jubilee, Shakespeare had begun to take on the status of a national icon, distilling in a single figure all of England’s artistic–and even moral–accomplishments. There was, by the end of the eighteenth century and the beginning of the nineteenth, a very palpable intersection of Shakespeare the artist and Shakespeare the patriot; in his histories and tragedies especially, the unwavering voice of a nation seemed to speak forth. The printer Luke Hansard was keen to pick up on this association when he printed, in 1803, a folio broadside entitled “Shakespeare’s Ghost, Our Immortal Bard Who Was as Good an Englishman as a Poet.” The implications of Hansard’s word placement are clear; Shakespeare mattered for his national, patriotic allegiances over and above the mere aesthetic accomplishments associated with poetry. 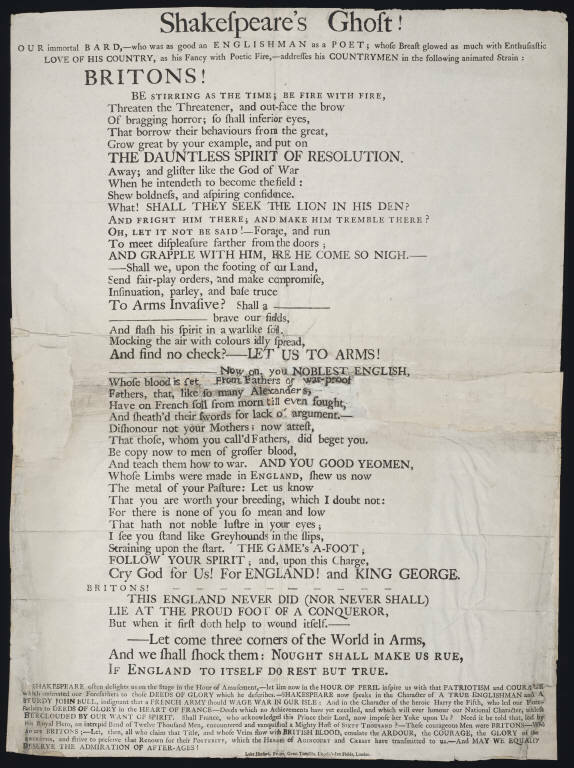 The timing, though, is worth bearing in mind; Hansard’s broadside was issued at a moment of some patriotic anxiety, when an invasion by Napoleon had begun to seem a very real threat, and the broadside’s many quotations of Shakespeare’s more patriotic lines culminate in an exhortation to the English people to remain steadfast in their resistance to French forces.